Hardcover book with sewn binding and anti-scuff matt lamination. Contains 220 interior pages printed on deluxe paper (Munken Lynx) and the digital "Soundtrack to Ars Umbra".You may not be aware, but you already know the art of ESTER SEGARRA. For over a decade, the Spanish photographer has re-imagined the visual aspect of heavy metal for GHOST, WATAIN, ELECTRIC WIZARD, CATHEDRAL, MAYHEM, KATATONIA, PARADISE LOST, AT THE GATES, CARCASS, DARKTHRONE, ROTTING CHRIST, VENOM, ABBATH, and others. Her anthology book 'Ars Umbra' celebrates 15 years of music photography. 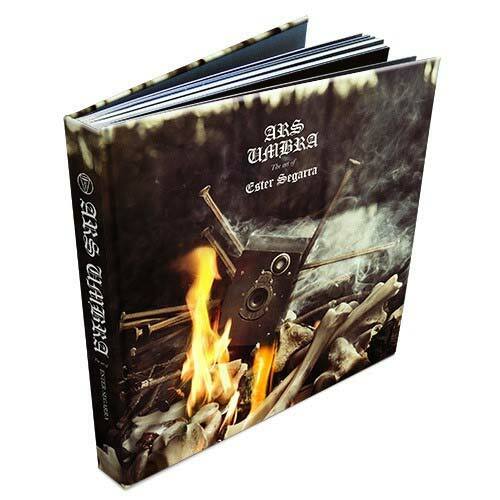 Pictures and music are presented in the form of a photo book with an added original soundtrack. The music provides a rhythm, a mind-space that alters the experience of the book.Soundtrack is made by Uno Bruniusson (ex-IN SOLITUDE, DEATH ALLEY, PROCESSION).